If you are intressted please feel free to contact me on discord : shortnerd99#3857 or click on the icon below. Last edited by shorty127; 01-27-2019 at 11:58 AM. Last edited by shorty127; 03-14-2019 at 01:50 PM. Last edited by shorty127; 03-14-2019 at 01:09 PM. Great boosting service from Shorty127! if you are a platinum player and you want to get to diamond this is the best and cheapest service you can get no doubt! I absolutely recommend this service and would use it myself again! 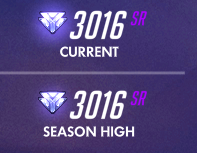 Boosted from 2300ish to 3018. Good communication and FAST! Would use again and recommend! Last edited by shorty127; 03-14-2019 at 01:10 PM. Hey all i was a customer and shorty boosted me from bottom gold to diamond thanks again you boosted this n00b for a great price would recommend to all. Indeed, he is a cool, funny and skilled man. It was like I was playing with a friend, for real ! And all that with the cheapest price I've found (I texted at least 10 others boosters beforehands). In conclusion, I definitively vouch for Shorty ! Last edited by shorty127; 03-14-2019 at 01:11 PM. Last edited by shorty127; 03-14-2019 at 01:14 PM.